The latest offering from Olloclip has two macro lenses. 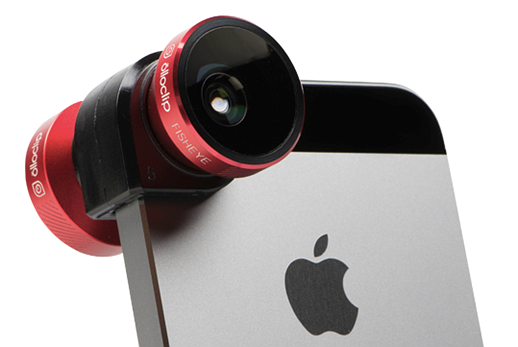 Olloclip has announced a new lens accessory for iPhone 5/5S and 4/4S. The 4-in-1 lens offers a wide angle, fish eye and two different macro lenses. This new lens combo from Olloclip reminds us of its first product — a 3-in-1 lens with a fisheye, a wide-angle lens and a 10x macro lens. Now, for the same $69.99 price, Olloclip is throwing in an extra 15x macro lens. While the new lens may not seem very different from the original, Olloclip promises that the 4-in-1 lens takes clearer photos with less distortion than its predecessor. We look forward to getting our hands on the new accessory and testing it out ourselves. Fisheye lens: The Fisheye lens captures approximately a 180-degree field-of-view and produces some striking images. Wide-Angle lens: The Wide-Angle lens is great for when you need that extra field of view, approximately double that of the normal iPhone. 10x Macro lens: Choose the lens based on the level of detail you’re looking for. The 10x Macro Lens has an approximately 18mm focus distance. 15x Macro lens: The 15x Macro Lens has an approximately 12mm focus distance. To access either Macro lens, simply unscrew and remove the Wide-Angle or Fisheye. I was an early Olloclip adopter but when the iPhone 5 came out and the Olloclip didn't fit I decided to try one of the cheap Chinese copies at about 15% of the price. Can't say I've noticed any difference in IQ, given that I'm not expecting Leica quality from either device. That's not what these things are for. Can't imagine why I'd want to use a phone for macro pictures anyway. Loser + no eye and can't pick the right tool = why are you reading a mobile photography site? Buy a decent bridgecam or travelzoom and you will not make your life miserable with mobile photography. My life is far from miserable - I'd never waste money in a travel zoom. I'd rather use the primes on my Canon5D MKII or my Fuji X-E1...or maybe my X100. Choose the right tool, be a happy camper. Or be a tool, your choice.